Many people claim to know what Jesus would say or do in the kinds of ethical dilemmas we face today, but applying “traditional” Christian values out of context actually sells Jesus’ teaching short. 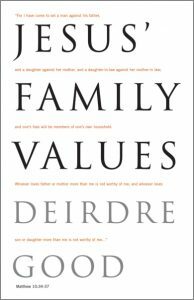 What are Christian family values, Deirdre Good asks, why are there so many interpretations of what Jesus actually taught and said, and which of these biblical values should guide our lives? She begins by setting this conversation in the context of the Greek, Roman, Jewish, and first-century sectarian world, and criticises the attempts to use biblical texts literally in advocating for marriage and the family. Other chapters will take up the meaning of house and home, marriage and divorce, and biological ties vs. extended families and communities. Through careful attention to the words and stories of Matthew, Luke, Mark, John, and the letters of Paul, Good provides an ideal method for studying the Bible to find out what it actually says to our communities and households today. Jesus’ Family Values is a rigorously scholarly examination of exactly what “family values” and dimensions of the family were in the days of Jesus Christ and the apostles, and precisely what the New Testament has to say – and what it doesn’t say – about such matters. Setting scripture in a firm and well-researched historical context, and meticulously noting the nuances of translation as well as which scriptures are considered apocryphal by which churches other factors influencing their interpretation, Jesus’ Family Values makes every effort to analytically answer the questions: What were Jesus Christ’s family values, and those of his apostles? What does this mean for modern Christians with abiding faith in both God and the importance of family? Of especial note is the keen observation that today’s suburban family household divorced from the workplace perhaps resembles Victorian era households more than those of Jesus’ time. A desperately needed antidote to proponents of “family values” who quote or misquote snippets of scripture to support specific narrow views, Jesus’ Family Values places the highest value of all on truth – and concerning such thorny and controversial topics such as religion, the best way to reach the truth is to offer as much research, evidence, broad-ranging interpretation, and logical means of analysis as reasonably possible and let the reader come to his or her own informed conclusions, precisely as Deirdre Good has done. Highly recommended.